Everyday Fashionista - Atlanta Blogger: Mamma Mia! 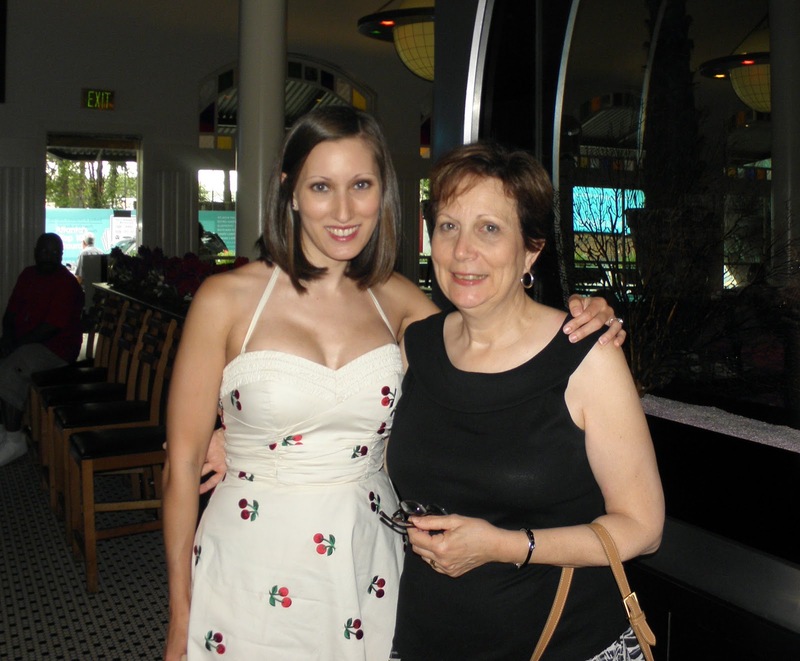 Sunday, I enjoyed a wonderful dinner out with one of the most important people in my life: my mom! We went to a great seafood place here in Atlanta: the Atlanta Fish Market. My mom tried sea bass for the first time (she loved it), and I had this delicious stuffed flounder casserole. It was amazing, and chock full of seafood bites like scallops and shrimp. I also enjoyed the buttery mashed potatoes that came with the meal. I'm such a sucker for potatoes! My mom and I even splurged on dessert: Apple Crumb Tart with cinnamon ice cream. It was delicious. The outing also gave me a chance to wear one of my favorite summer dresses: this Betsey Johnson Cherry Embroidered Halter Dress. I love this retro look so much. Every time I put this dress on, I feel like I am going to a picnic in 1955. Can't you just see Marilyn Monroe wearing a dress like this one? I paired the dress with my BCBGMaxAzria Holiday Red Peep Toe Pumps. Here's a picture of me with my mom at the restaurant. Isn't she fabulous?